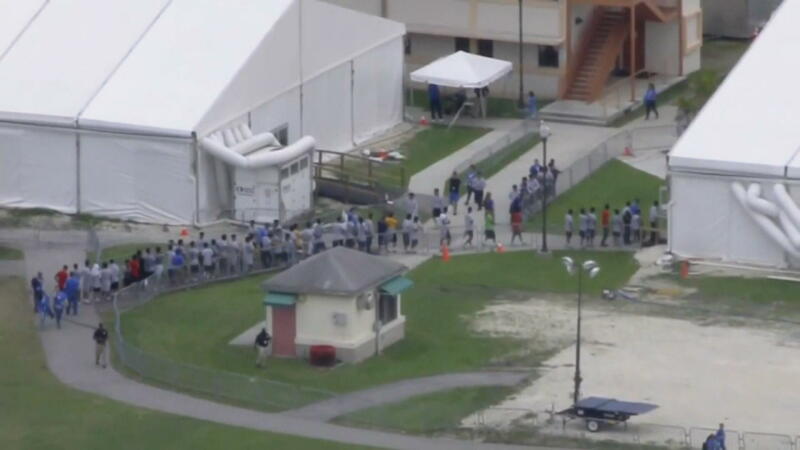 Miami — A federal facility for unaccompanied migrant children in Homestead, Florida, is set to nearly double in size and is rushing to bring on hundreds of new employees. The Homestead facility's mid-January expansion was announced by the United States Department of Health and Human Services (HHS) on December 26, the same day the agency disclosed that a larger temporary facility in Tornillo, Texas, would soon close. At a job fair in a small Holiday Inn Express conference room in Miami on Thursday, a steady stream of candidates were asked to wait in rows of seats before being directed to laptops where they filled out applications. They sought jobs ranging from case worker to travel chaperone. Representatives of Comprehensive Health Services (CHS), the company that is paid by HHS to manage the facility, stood by with a stack of "contingent job offer" letters. A Facebook post advertising the event states, "We will be extending offer letters on site to qualified applicants!" The letter indicates the offers are dependent on successful drug and background screenings. Employees at the Homestead facility must undergo the FBI's fingerprint criminal history check, but the federal government has granted a waiver allowing the facility to bypass Florida's child abuse and neglect background check system, according to HHS Deputy Assistant Secretary for Public Affairs Mark Weber. The waiver was granted to Virginia-based CHS because companies that are not regulated by the state's child welfare and foster care authorities are not allowed to access its Statewide Automated Child Welfare Information System database. In an email to CBS News, Weber said "the FBI fingerprint background checks conducted on employees would show relevant information." However, FBI checks would not surface what state policy refers to as "verified maltreatment findings" that are not necessarily prosecuted, but are logged in the system because "a preponderance of credible evidence exists to support the allegations of abuse, neglect or abandonment." That means there could be important information in potential employees' pasts that CHS is missing, according to Stacie Schmerling, a Partner at Talenfeld Law, a Fort Lauderdale, Florida-based firm that specializes in child abuse cases. "The FBI search won't have the same information as the (state child abuse and neglect) database," Schmerling said. "This is a facility for unaccompanied children, so you'd want to approach it like foster care, where you try to gather as much information as possible about someone's history." In June, CBS News reported that because Homestead and the Tornillo facility are on federal land, they are not subject to the stringent child welfare inspections required for all other shelters for unaccompanied children, which are on state land. CHS, and all employers across the country, also cannot access the Department of Homeland Security's E-Verify platform, which checks eligibility to work in the United States. The facility is expanding amid the partial government shutdown. In its "contingent job offer" letter, CHS indicates that the shutdown may have affected human resources staffing. "Due to the temporary government shutdown, we have limited personnel available to assist with your onboarding," the letter states. Asked about the letter's onboarding claim, an HHS representative referred CBS News to CHS. A spokesperson for CHS' parent corporation, Caliburn International, did not return a request for comment. The shutdown does not appear to be slowing the rate at which new staffers are being hired. An employee of the Homestead facility, who asked not to be identified, told CBS News applicants were being hired on the spot at the job fair — as promised in the company's Facebook flyer. The employee complained that new hires were being brought on for supervisory positions, instead of those with seniority. "They're hiring so many people with no experience. Some are getting jobs better than me," the employee said. Caliburn did not reply to a question about the experience levels sought for youth care workers, case managers, clinical counselors, educational instructors, drivers, and travel chaperones at the facility. Caliburn has also repeatedly declined to speak with CBS News about the Homestead facility's rapid expansion. According to HHS, the facility currently employs 1,600 people while holding 1,250 children. It ultimately will fit 2,350 children, and will have to staff up to meet that need. The site is required to have no more than 12 children for every one adult supervisor, 24 hours a day, according to HHS, plus security, medical, case management and operations personnel at all times. It is not clear how much Caliburn is paid to operate the facility, but the revenue is not without risk, according to an October 9 SEC filing. "In the past, we have received negative publicity for this work with (HHS), and it is possible that we may be subject to such negative publicity in the future as well," the company wrote. "Allegations of impropriety or reports mischaracterizing our activities or criticism of the missions that we are supporting have the potential to cause us reputational harm." It was a concern echoed by the employee who spoke with CBS News. "The kids are treated good in there. It's not like the media portrays it. We treat them well," he said.